AddPac Technology AP-VP700 HD IP video phone is designed to deliver high quality video telephony service over IP network. This new and potent HD video phone delivers the various IP communication solutions taking a full advantage of new ‘all-in-one concept’ with voice, audio and video application integrated. It provides not only cutting-edge features such as various AV in/out interfaces, QoS functionsbut also a wide range of multiple VoIP signaling such as SIP, H.323 protocols and H.263, MPEG4, H.264 video codecs.With its modern design, AddPacHD IP video phone is equipped with the latest audio/video codec, high quality LCD and built-in camera interfaces. From the video conferencing, video telephony to audio/video broadcasting, AddPacHD IP video phone becomes the best choice of all. AP-VP700 is a new HD IP video conference phone where Internet voice communications are combined with Internet video communications. This product provides advanced features and services such as video codecs (e.g. H.263, MPEG-4, and H.264), External A/V I/O interfaces, QoS video service as well as multiple VoIP signaling protocols such as SIP and H.323. AP-VP700 is a high-performance multi-functional HD IP video phone where the state-of-the-art video processing technology is added to the voice processing technologies developed by AddPac in the multimedia IP telephony field. AP-VP700 has better video features since it ensures 720P high definition video due to a high-quality 12.1 Inch LCD and you can enjoy a large screen connected to the external monitor. AP-VP700 supports max. 30 frames of 720P HD images which is considered promising for the high quality HD video application. Since AP-VP700 supports networks 256 Kbps to several Mbps, it is available at any Internet-enabled place. 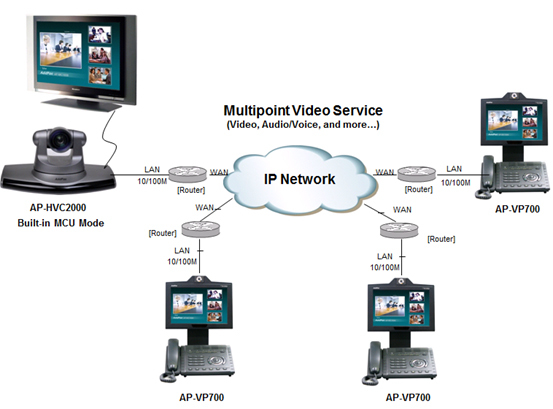 Above all, AP-VP700 ensures the best video quality due to the ‘rate control’ function that ensures the best video quality and frame rate at a limited bandwidth and the high-end error resilience technology for troubleshooting various packet failures on the Internet. AddPac Technology's VoIP gateway products, IP telephony products and various multimedia products such as video phone, video conference have been highly appraised with their advanced performance and reliability by worldwide customers. With its years of experience and know-who would make AP-VP700 as the ultimate solution for next-generation HD IP video telephony service.